1 of 3 Heat grill to medium-high heat. Heat oven to 400 degrees F. Pulse mushrooms in food processor or finely chop them by hand. Transfer to a bowl and add ground turkey, grated onion, oregano, salt and pepper. Mix gently and shape into 8 patties, each about 3 inches in diameter. 2 of 3 Bake rolls at 400 degrees F for 12 minutes or as per package directions. Split in half. Grill patties 3 to 4 minutes. Flip over and grill an additional 3 to 4 minutes. Top each with a slice of cheese and grill 1 minute. 3 of 3 Transfer burgers to split rolls and top each with a slice of tomato. 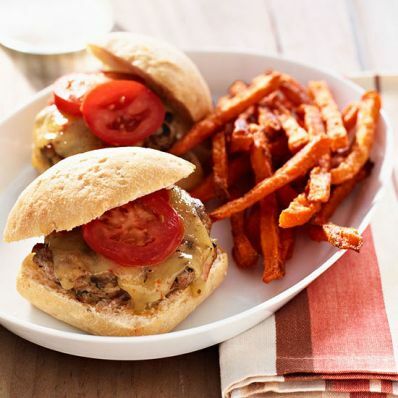 Serve with sweet potato fries, if desired.